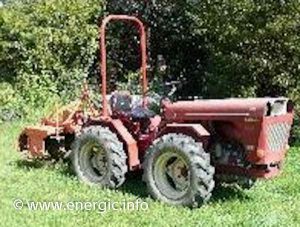 Energic 4 RM 1038 tracteur 35cv Ruggerini motor. The replacement for the Slanzi moteur 1500cc (1962 – 1976). This is the third generation replacement for the Energic 4 RM 28 (this used a up rated 35 cv Ruggerini moteur different from the previous 1500 cc Slanzi 2 cylinder moteur 35cv ). Available from the 1977/82. This was due to the Italian manufacturer of Slanzi being bought out and merged into the large Italian engineering group Lombardini in the late 1970’s. Lombardini replaced some Slanzi installations with the more up to date Ruggerini engines/moteurs of the time. Engine/ Moteur. Ruggerini Diesel 1500cc (actual 1492 cc), type RD 100/2P, 35 cv, bi cylinder, 4 stroke, 4 wheel drive. Max. rev. per min. 3000, dry weight 132 kgs, (The replacement for the Slanzi moteur 1330cc/1500cc from 1962 – 1976). 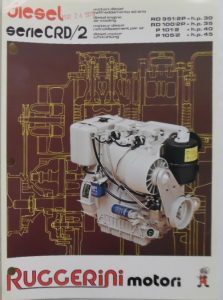 Energic 4 RM 1038 35cv tracteur 35cv Ruggerdini motor 1979 brochure model. 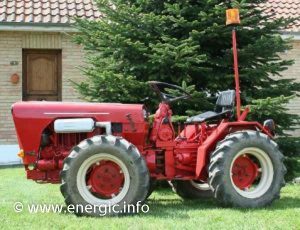 Energic 4 RM 1038 35cv tracteur 35cv Ruggerdini motor 1979 rear view. Read more about Ruggerini engine/moteurs in Energic Tracteurs here. 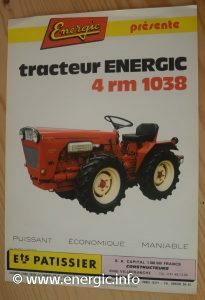 Energic 4 RM 1038 tracteur 35cv Ruggerini moteur 1979 model. Wheels; front & rear 750 x 16. Fuel tank capacity; 10.5 ltr. Energic 4 RM 1038 35cv tracteur 35cv Ruggerdini motor in need of restoration. 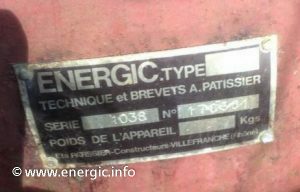 Energic 4 RM 1038 tracteur 35cv Ruggerdini moteur 1981. (face lift model). Front view. PTO; 3 PTO’s/Prise de forces, available in all gears. Forward PTO’s options operated directly from the gear box. There was also the option of a intermediate PTO. The third PTO was situated at the rear. The PTO was available in all 9 gears to a max. @ 2000 t/m. With the tracteur moving;1st gear 270 turns/minute t/m, 2nd gear 372 t/m, 3rd gear 540 t/m, 4th gear 800 t/m, 5th gear 1080 t/m, 6th gear 1520 t/m. Tracteur stationary; 1st gear 790 t/m, 2nd gear 1085 t/m and 3rd gear 1580 t/m. 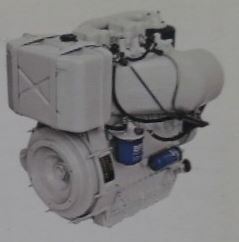 Energic 4 RM 1038 35cv tracteur 35cv Ruggerdini motor engine plaque. Fuel filters. Cartridge type, replaceable. Hydraulic lift; 3 point – with a lift max. force of 4 tons, Manuel adjusters for hydraulic, operation of the hydraulics from the instrument console. 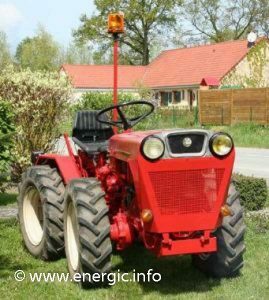 Energic 4 RM 1038 tracteur 35cv Ruggerdini moteur 1981 model (face lift model). Side view. Steering. ZF power assisted steering. Seat; Height (0.80m) and pitch adjustment, height bonnet 1m. Oil lubrication. By internal pump. Oil Capacity. Gear box 11+ liters, Pont 12 liters and Pont rear 4.5 liters. 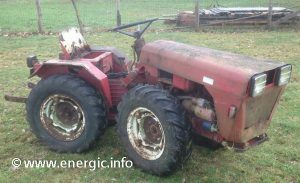 Energic 4 RM 1038 tracteur 35cv Ruggerdini moteur 1981. (face lift model). Read more about Ruggerdini history and engines/moteurs in the Energic Brand here. Read more about the Petrol/Essence Energic Mototracteur 712 here. Read more about the Diesel Energic Mototracteur 712 here.